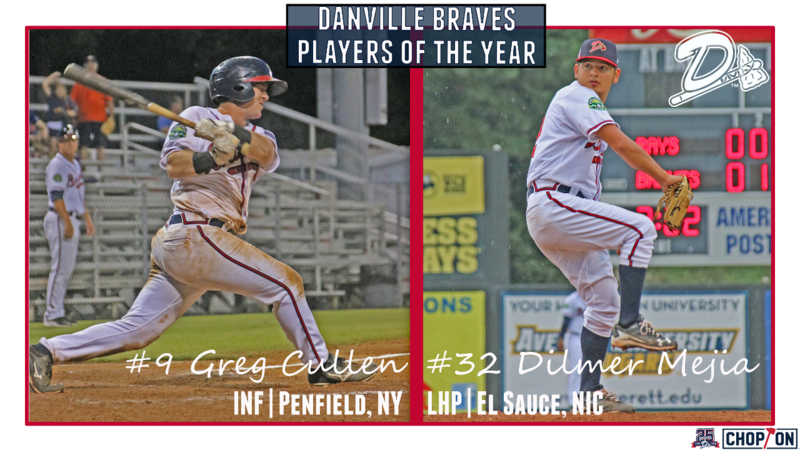 Cullen, 21, was selected as the D-Braves player of the year. The 15th round pick in the 2018 first-year player draft led Danville in hits (58), doubles (12), RBIs (33), total bases (82) and walks (29) in 55 games. The second baseman batted .280 with an on-base percentage of .373 and slugged .396. The product of Penfield, New York, hit in the second and third position in the batting order in 44 of his 55 total games, hitting .281 and driving in 28 runs. Cullen prevailed as the team leader with 10 multi-RBI games, including a four-RBI game against Bluefield on July 14. The left-handed batter reached base safely in 14 consecutive road games from June 24 to July 28, managing a .333 average with 10 RBIs in that stretch. Mejia, 21, earned honors as the D-Braves pitcher of the year. Mejia was named the Appalachian League pitcher of the year and the left-handed pitcher on the All-Star team earlier this month after posting a 5-4 record with a 2.87 ERA in 69 innings pitched and punched out 53 opponents. The product of El Sauce, Nicaragua, lead the Appalachian League in games started (13), second in ERA (2.87), innings pitched (69.0) and opponents average (.249) and fourth in WHIP (1.290). Mejia was atop of the D-Braves starting pitching staff in ERA, strikeouts and wins. The fifth-year professional managed quality starts in seven of his 13 starts, hurling his best start on July 5 at Greeneville where he stretched out seven scoreless innings while only surrendering four hits and striking out five Reds. For up-to-date information on the 2019 season, fans can keep close tabs on dbraves.com.